This article was published in European Polymer Journal. The focus of this study is an investigation of the effect of oxidation state of phosphorus in phosphorus-based flame retardants on the thermal and flame retardant properties of polyurea and epoxy resin. Three different oxidation states of phosphorus (phosphite, phosphate and phosphine oxide) additives, with different thermal stabilities at a constant phosphorus content (1.5 wt.%) have been utilized. Thermal and flame retardant properties were studied by TGA and cone calorimetry, respectively. The thermal stability of both polymers decreases upon the incorporation of phosphorus flame retardants irrespective of oxidation state and a greater amount of residue was observed in the case of phosphite. Phosphate was found to be better flame retardant in polyurea, whereas phosphite is suitable for epoxy resin. 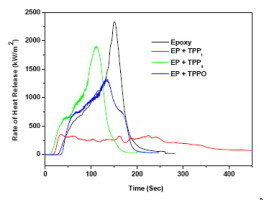 Phosphite will react with epoxy resin by trans-esterification, which is demonstrated by FTIR and 31P NMR. Further, TG–FTIR and XPS studies also provide information on flame retardancy of both polymers with phosphorus flame retardants. program for screening substances for potential hormonal activity. – establish a bond between investigators in the various parts of the fields and to provoke a reflexion on future collaborative programs. The workshop will be organised on the basis of a four half-days meeting. Each session will be devoted to one-two peculiar aspects and will be introduced by general presentations followed by short presentations on recent results. This workshop could be placed under the auspice of the MoDeSt Society. This article was published in Journal of Materials Chemistry A , Jul 2013. The flame retardance of glass fiber reinforced polymers is an important worldwide challenge due to the wick effect caused by glass fiber. In this paper, an interfacial flame resistance mode was proposed in order to solve the problem in an efficient and economic manner. Unlike the conventional bulk flame resistance mode based on a high loading of flame retardants distributed evenly throughout the entire composite matrix, the interfacial flame resistance mode concentrates only a very low content of flame retardants located in the glass fiber–polymer interfacial regions, where the wicking action occurs, grafted on the glass fiber surface. According to this new mode, glass fiber reinforced and flame retarded polyamide 6 was prepared and evaluated. At the combustion temperature, the interaction between the polymer (polyamide 6) and the grafted flame retardant quickly produced inert and rough interfacial chars replacing the original smooth and high-energy surface of the glass fiber. The interfacial char layer could effectively block the adsorption, wetting, spread and flow of the polymer melt on the glass fiber surface, therefore, greatly weakening both the thermodynamic and dynamic processes that induce the wicking action. In addition, the formation of organic side chains on the glass fiber surface by the graft reaction also contributed to an improvement in the interfacial compatibility, favoring enhanced mechanical properties of the composites. The interfacial flame resistance mode provided a novel means for preparing advanced flame retardant glass fiber reinforced polymers.